Previously we mentioned about ArchiveClipboard that can copy and paste multiple texts, images and folders’ paths, here comes a similar utility that is suitable for those that deals a lot with copy and paste tasks. Named as PasteCopy.NET, it has advantage of tinier form factor and best of all, it doesn’t require installation and can be used across different Windows systems without constraint. Once download the .zip package file and without the need of installation, a simple GUI will be displayed ready for use. 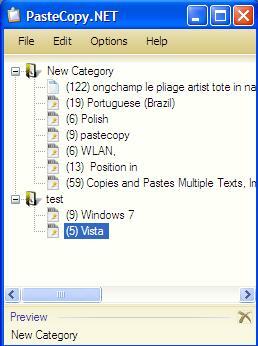 For the start, users can define or add new category so that the copied text can be categorized accordingly in systematic way. No complicated setup required, just copy (Ctrl + C) any text and it will appear under the highlighted category one after another in sequence. Selecting on any of them enables it to be pasted directly with Ctrl + V. Good thing is, users are allowed to edit the text by double clicking on it to make it much more powerful as compared to other utilities. Besides working for pure text, similar step works for copied images as well that will put them in the list except limitation to not able to edit the image files. On top of all these features, there are also options to convert Rtf to text, HTML to text, HTML to Rtf and even export list to be stored or printed. Consumed less than 300kB, users can get a free download here (installer version) or here for standalone ZIP version.